12 mins. to 17 mins. 34 mins. to 47 mins. 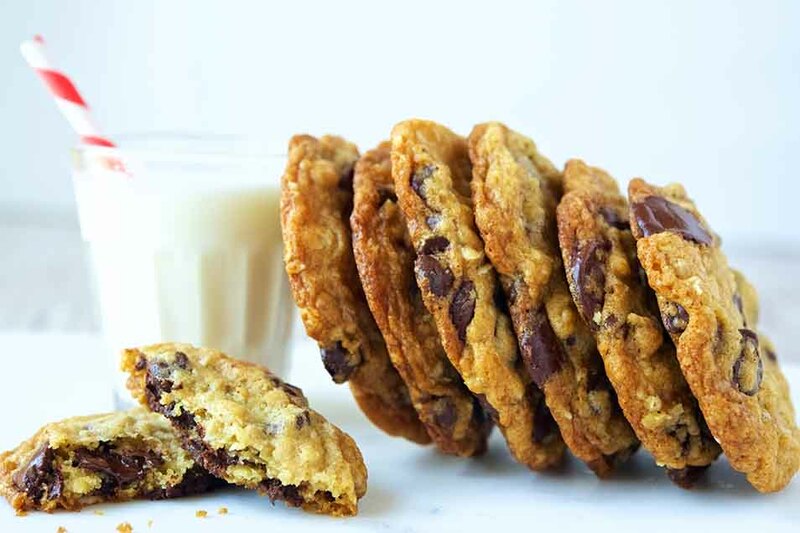 These cookies, our 2015 Recipe of the Year, are soft and chewy, packed with chips, and go beyond the standard chocolate chip cookie with the addition of nutty tasting oats. They're a specialty of our Bake Truck, which travels the country serving these as part of our Bake for Good fundraising program. Our thanks to the Cookies for Kids' Cancer non-profit, the originator of this recipe. Baking gluten-free? For great results, substitute King Arthur Gluten-Free Measure for Measure Flour for the all-purpose flour in this recipe; no other changes needed. Or enjoy our recipe for Gluten-Free Chocolate Chip Oatmeal Cookies. Preheat the oven to 325°F. Line several cookie sheets with parchment paper, or lightly grease with non-stick vegetable oil spray. Beat together the butter and sugars until smooth. Beat in the egg, egg yolk, and vanilla. Whisk together the flour, oats, baking powder, baking soda, and salt, and add to the butter mixture in the bowl. Mix until everything is thoroughly incorporated. Scrape the bottom and sides of the bowl, and mix briefly. Decide what size cookies you want to make. A muffin scoop (1/4 cup) will make 20 large, palm-sized cookies. A tablespoon cookie scoop (4 teaspoons) will make 50 medium (2 3/4" to 3") cookies; and a teaspoon cookie scoop (2 teaspoons) will make 100 small (2 1/2") cookies. Scoop the dough onto the prepared baking sheets, leaving about 1 1/2" to 2" between cookies. Bake the cookies for 12 to 17 minutes, until they're a light golden brown, with slightly darker edges. Their middles may still look a tiny bit shiny; that's OK, they'll continue to bake as they cool on the pan. Remove the cookies from the oven, and as soon as they're set enough to handle, transfer them to racks to cool. Yield: 20 to 100 cookies, depending on size. Feel free to substitute a 1-pound bag of chocolate chips for the 18 ounces (3 cups) called for. These cookies make wonderful ice cream sandwiches. Sandwich two cookies around a scoop of softened ice cream — we especially like Ben & Jerry's (Phish Food! ).